Art & Religion in the 21st Century is now available in paperback. Our advisor Aaron Rosen’s book is available here. Blaspheming artists get all the press. Some exploit the shock potential of religious imagery – but many also reflect deeply on spiritual matters and are, in fact, some of the most profound and sensitive commentators on religion today. 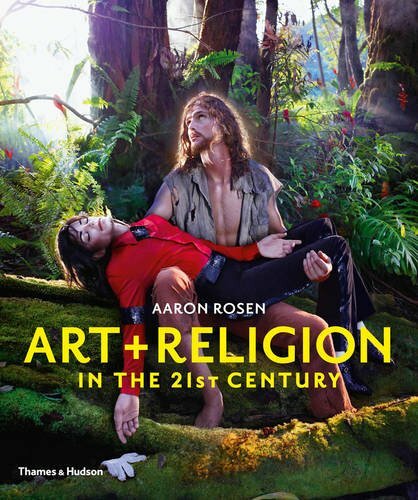 Here, Aaron Rosen shows how religious themes and images permeate the work of contemporary artists from across the globe. Art & Religion in the 21st Century is the first in-depth study to survey an international roster of artists who use their work to explore religion’s cultural, social, political, and psychological impact on today’s world. An introduction outlines the debates and controversies that the art/religion connection has precipitated throughout history. Each of the book’s ten chapters introduces a theme―ideas of the Creation, the figure of Jesus, the sublime, wonder, diaspora and exile, religious and political conflict, ritual practice, mourning and monumentalizing, and spiritual “dwelling” in the body and in space―followed by a selection of works of art that illustrates that theme. The previously published hard cover edition is available on Amazon here.